Electronics can be maddening sometimes! Like when you want to hookup that totally groundbreaking, awesome, must-have sensor, which has a maximum input voltage of 3.3V, to an Arduino running at 5V. Ack! Connecting these devices can be a problem -- applying an out-of-range voltage to a device's I/O pin can overstress it and eventually lead to failure. This is a dilemma so common we designed a simple PCB assembly to make interfacing devices a little easier: the Logic Level Converter. The LLC can convert up to four I/O lines from a high-to-low and low-to-high. Two inputs convert from low voltage to a higher, and the other two line convert bi-directionally (high-to-low and/or low-to-high). In this tutorial we'll take an in-depth look at the Logic Level Converter. Check into it's schematic. Explain what each pin on the board does, and where it goes. Then we'll go over some example hook-ups, explaining how you might use the board in a serial interface, or SPI, or even I2C. Essentially, there are two different circuits at work here: a voltage divider and a MOSFET-based, bi-directional level shifter. The voltage divider level-shifting circuits cut a high voltage down by 66%. The voltage divider ratio was chosen to divide a high voltage of 5V down to 3.3V, the most common use case for the LLC. Note that the voltage-divider circuit can't work the other way -- it can't make a voltage higher. That's why we need a different circuit for the other half of the LLC. Through the magic of semiconductors, the MOSFET-based circuit on the LLC can turn a low-level signal into a higher one. Actually, this circuit has the added benefit of working both ways, it's bi-directional. If one line is pulled low (0V), the MOSFET will be put into a conducting state and the other input/output line will go low too. If both lines are left alone, they'll both idle to a logic high (3.3V, 5V, etc.). The middle section of the board is where the reference supply for your high and low voltages should go. Supplying voltage to all four of these pins is required. 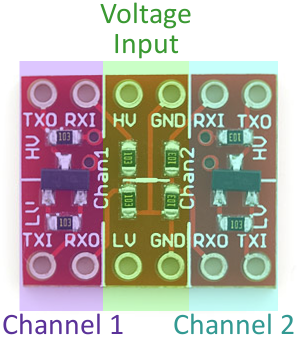 If you're converting 3.3V to 5V (and vice-versa), for example, you'd run 5V into the "HV" side, and 3.3V into the "LV" input. Make sure each is grounded too! 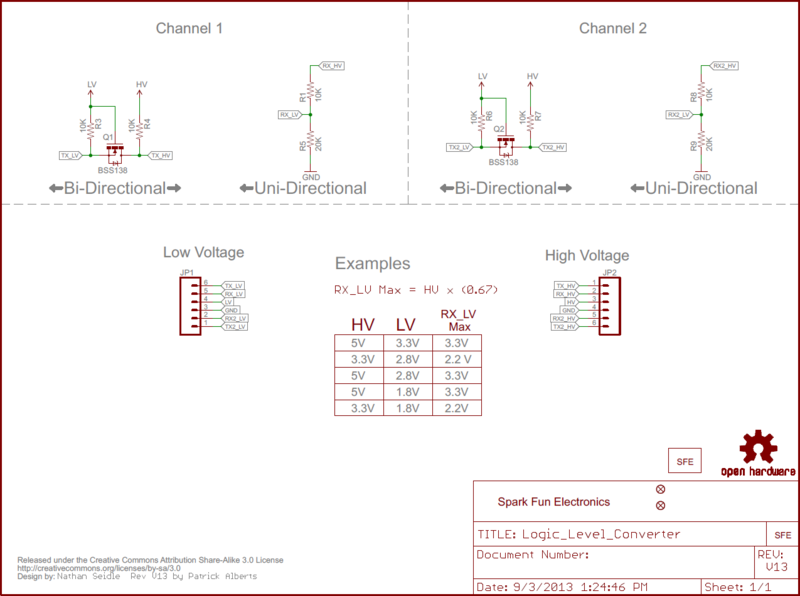 RXI -- High voltage input to voltage divider from high-voltage device. Signal will be shifted down and sent to low-voltage device on "RXO" pin. 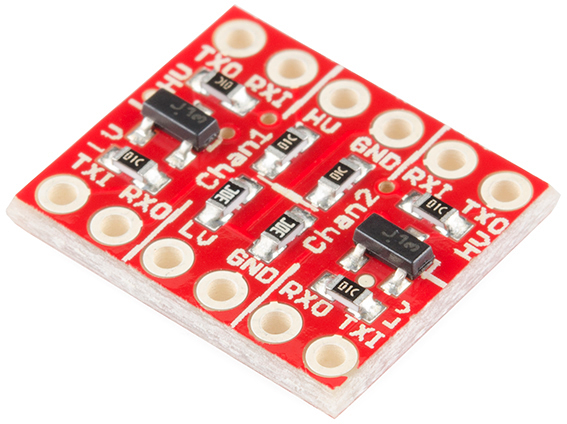 RXO -- Low voltage output from voltage divider to low-voltage device. Signal is shifted down from "RXI" input. TXI -- Low voltage input/output of MOSFET circuit. This pin interacts with "TXO" on the high side. Bi-directional, but this is the only shifter that will shift from low to high. TXO -- High voltage input/output of MOSFET circuit. This pin interacts with "TXI" on the low side. Bi-directional, but this is the only shifter that will shift from low to high. 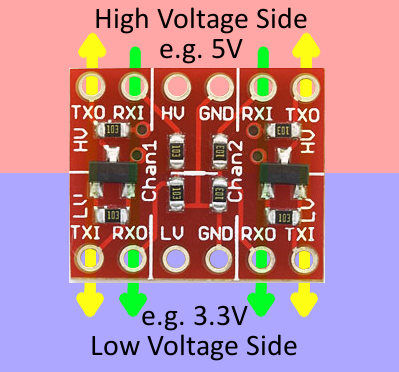 To send a signal from the low-voltage side to the high-voltage side (e.g. from 3.3V to 5V), the signal must be input at "TXI". It'll pass through the converter and come out as a higher voltage on the "TXO" (transmit output) pin. On the other hand, a signal that strictly travels from high to low-voltage should pass from "RXI" to "RXO". Using this board is probably a lot easier than the length of this page would imply. Let's look at some example configurations next. Before you can plug the converter into your system, you'll need to solder something into it. There are a lot of options here. You could solder straight male headers in, and plug it right into a breadboard. Or perhaps you want to solder wires directly into it. 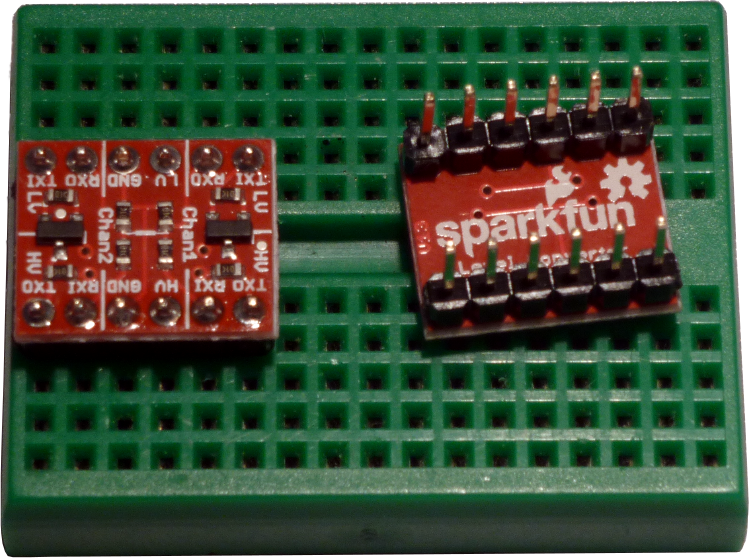 Pick an assembly method that melds with how you intend to use the board. Male headers soldered into the LLC so it can be inserted into a breadboard. 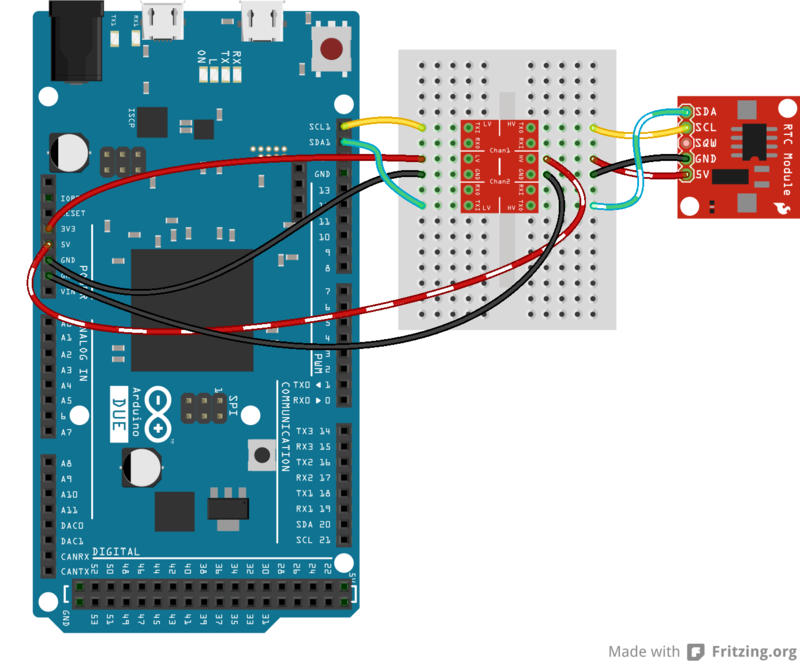 Please note that the Arduino and the Electric both have their own power supplies in this example. All of these 'RX', 'RXI', 'RXO', and even 'RX0' labels can get confusing. Remember 'I' stands for Input and 'O' stands for Output. 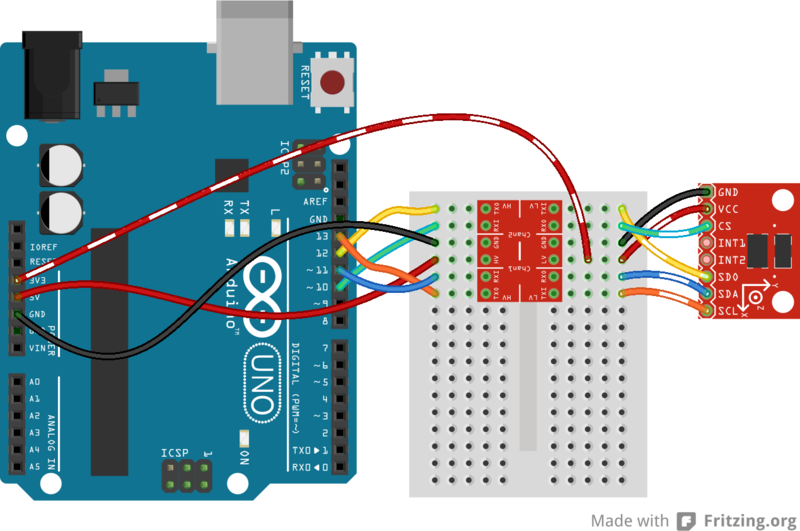 If the Electric Imp sends a signal out of it's 'TX' pin it'll go into the 'TXI' pin on the LLC, get shifted up to 5V and come out the 'TXO' pin, and finally run into 'RX' on the Arduino. A standard SPI connection requires four wires -- MOSI, MISO, SCLK, and CS -- so we'll need to use every pin on the LLC to shift this interface. I2C is another weird situation where both wires -- SDA and SCL -- need to be bi-directional. So to use the LLC for an I2C interface, we need to take advantage of both bi-directional shifters on the board. Philips AN97055 -- An awesome application note covering bi-directional level shifting circuits. 3V Tips 'n Tricks -- An informative document published by Microchip with lots of tips and tricks for interfacing between 3V and 5V systems. Electric Imp Breakout Hookup Guide -- The Electric Imp works at 3.3V max, so if you interface it with any 5V systems you may need an LLC. 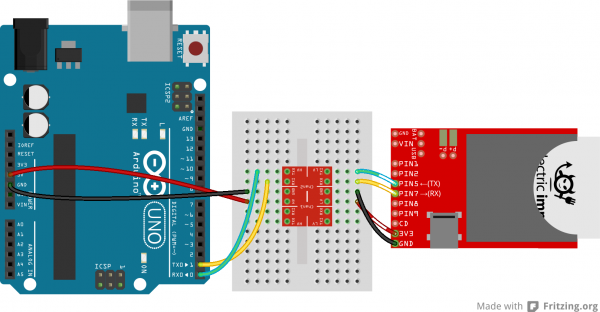 Getting Started with pcDuino -- The pcDuino is another 3.3V-based system. This is a powerhouse compared to the Electric Imp, though. It can run Linux or Android, and has all sorts of awesome functionality. Using the Arduino Pro Mini 3.3V -- If you want to stick with Arduino, and want to use 3.3V sensors, consider using an Arduino that runs at 3.3V. That way you won't even need to bother with an LLC!